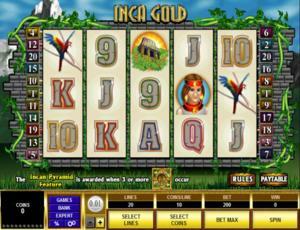 Inca Gold is an online video slot machine game released in December 2006. It is offered exclusively at online casinos powered by Microgaming. This online video slot game has 5 reels and 20 pay lines. The theme of Inca Gold is inspired by the Incan tribes and their possession of vast riches of silver and gold. The legend of the Incan gold started in the 16th century, the time when the great Inca Empire in western South America was being invaded by Europeans. The Incan King Atahualpa was captured at his palace by Spanish commander Francisco Pizzaro. Pizzaro agreed to release the Incan king in exchange for a roomful of gold, but the crafty Spaniard did not keep his word. He had the king put to death before the final and biggest portion of the ransom had been delivered. It was thought that the Incan general in charge of delivering the ransom had the final shipment of gold be hidden away inside a secret mountain cave. You will surely have a fun time in this slot game as you spin the reels, unlock the mysteries of the secret mountain cave, and grab that legendary Incan gold in the Inca Gold online slots game! Microgaming online slot games are available to players in 2 formats – download and no-download. Whether you like to download their software first or you prefer to play instantly without the need to download, then Microgaming surely has online slot machine games to accommodate your every slot gaming preference. Inca Gold is a slot game that belongs to the download category, which means you must download first before you are able to play this particular slot game. Inca Gold is created for those who love gold because they can practically buy anything they want with it. Many players say that they actually enjoyed playing this particular slot game, because it offers lots of things that highly benefits all slots players. The Inca Gold online video slot game features scatter wins, a wild multiplier symbol, 2 fun Bonus Feature games (Incan Pyramid Bonus Feature game and the Free Spin Bonus Feature game, a maximum coin jackpot of 10,000, and a maximum cash jackpot of $50,000! The quality of the graphics and sound that Microgaming provides is absolutely incredible and top notch. They have an impeccable reputation of making the most eye-catching graphics and superb sound effects that will truly transport you to “that specific theme” they used in any of their slot games. Most people love to play games run by Microgaming software because they have smooth animation and engaging yet non-interfering sounds. Before starting the game, you will be treated to a short clip of an ancient temple governed by a knowledgeable Shaman, and then you will see him somewhat announcing a prophecy of a girl who is the key to finding the gold treasures. The symbols are drawn in a semi-realistic manner. All symbols are nicely animated when they are included in winning combinations. The main color used in this game is green and silver, which means you will definitely not strain your eyes when you play this game for a long time. The overall graphic design of Inca Gold shows players a lush green meadow where you will find a secret passage (entwined with thick vines) that leads to a pyramid full of Incan gold. There is no constant background music when you play the main Inca Gold online slots game. When you spin the reels and get normal winning combinations, short flute-like music is played out. Serene flute music will be heard accompanied with an eagle’s cry are the background music and sound effects programmed while you play the Inca Gold Free Spin Bonus Feature game. Magical sounds with some thunder can be heard whenever you are playing their Incan Pyramid Bonus Feature game. The card deck symbols available in the Inca Gold online video slot game are 9, 10, J, Q, K, and Ace. The regular symbols that you will find in Inca Gold are: the Princess, Temple, Macaw, and Rattle. The Wild Symbol is the Priest. It is a wild multiplier symbol. Thus, the Priest wild symbol not only acts as a substitute for all other symbols (except for the Scatter symbol) in order to you help you form winning combinations, but it also can multiply the payout! The Priest wild symbol doubles (multiplier x2) the payout of any winning combination it completes, as long as it acts as a substitute symbol. You are paid varying prize amounts (refer to the Payout table) when you manage to form a winning combination with multiple Priest wild symbols on an enabled pay line. Take note that the Priest wild symbol winning combination payouts are not doubled. The Scatter Symbol is the Amulet. Scatter symbols mean that they do not need to appear in a line (on an enabled pay line) for you to win. The Amulet scatter symbol can be found scattered anywhere on the 5 reels, and you are able to form winning combinations as long as there are 2 or more Amulet scatter symbols that come out. Your winnings are calculated by multiplying the Amulet scatter symbol combination payout (refer to the Payout table) by the total number of coins you’ve bet. If you manage to get 3 or more Amulet scatter symbols, you will trigger the Incan Pyramid Bonus Feature game. Please take note that if you get a scatter win and a normal win, then you are paid out for both of these wins, because the Amulet scatter symbol is not required to come out on an enabled pay line for you to win. The scatter win is included to the pay line win. If you manage to get 3 or more Amulet scatter symbols (found anywhere on the 5 reels), you will trigger the Incan Pyramid Bonus Feature game. When the Incan Pyramid Bonus Feature game is triggered, you will get 5 Free Spins and a chance to win extra Free Spins or random amounts as bonus prizes in the Incan Pyramid Bonus Feature game. Ten pyramid blocks are presented to you. Select a block from each pyramid level. As you go up the pyramid, you may get Free Spins or random amounts as your bonus prizes, and these will be added to your win pot. If you successfully manage to reach the tip of the pyramid, you could have the chance to win a 150x multiplier on your overall bet amount, thus giving you higher chances of winning big! You could also win either a random bonus prize amount, plus all the accumulated bonus prize winnings. Please note that if ever you do not get any bonus prize amounts at any of the pyramid levels, you will be rewarded double the bet amount that triggered the Incan Pyramid Bonus Feature game, plus any accumulated bonus prize winnings. The Incan Pyramid Bonus Feature game will end if you do not find any Free Spins or random bonus prize amounts. Once the Incan Pyramid Bonus Feature game is over, you will be taken back to the main Inca Gold online video slot game, and your bonus wins are included to your balance. You initially get 5 Free Spins at the start of the Incan Pyramid Bonus Feature game, and you may have the chance to win extra Free Spins during the Incan Pyramid Bonus Feature game. Your winnings during the Free Spins are doubled! Please note that the Incan Pyramid Bonus Feature game cannot be triggered while you are playing out the Free Spins. Also, extra Free Spins cannot be won while playing out the Free Spins. Once the Free Spin Bonus Feature game is over, you will be taken back to the main Inca Gold online slot game, and your bonus game wins are included to your balance. Inca Gold has 5 reels where you may bet on 20 pay lines. The minimum bet is 0.01 and the maximum bet is 0.25 per pay line. You can wager 1 up to 20 coins per pay line bet. Therefore, the maximum bet amount is 100.00 per spin. Please take note that the amounts mentioned are in Pounds, but they will remain the same if you choose to play in US dollars, Euros, or Canadian dollars. Also, for every coin that you wager, you will enable another pay line. You will be paid out for winning combinations on enabled pay lines only. The maximum payout in the regular Inca Gold online video slot game is 10,000 coins per line bet. People who regularly play online casino games naturally love to stay longer on online slot games that have an Autoplay function. Good thing that Inca Gold is furnished with this function! In Microgaming online slot games, they have 2 game modes – Regular mode and Expert mode. You can have the game spin automatically for you with the Autoplay function that can be found by clicking the Expert button (located at the lower left portion of the game screen). After customizing the Autoplay function to your preferences, just click on the Start button, and the game will automatically spin for you while you just sit back, relax, and enjoy playing this Inca gold-themed online video slot game!